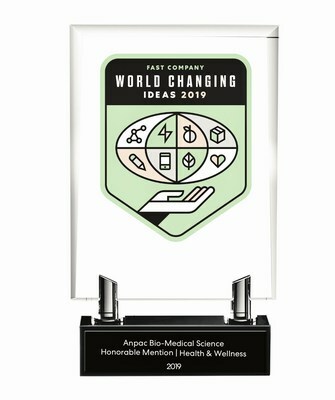 SACRAMENTO, California, April 11, 2019 /PRNewswire/ — The editors and judges of Fast Company Magazine selected Anpac Bio-Medical Science Company‘s, “Cancer Differentiation Analysis” (CDA) Liquid Biopsy technology as an international, 2019 Health & Wellness “World Changing Ideas Award” Honorable Mention recipient. Previously described as “game changing”, and receiving the, “Breakthrough Innovation Award”, at the World Nobel Prize Laureate Summit; and named, “Most Promising Cancer Screening Company”, at the Global Precision Medicine Industry Awards; Anpac Bio was also recently selected by the United States Department of Commerce as the, “Minority Health Firm of the Year”, due to the company’s remarkable, CDA liquid biopsy technology. Anpac Bio pioneered liquid biopsy cancer screening research. Comprehensive research validity data from 140,000+ cases (to date), and independently-corroborated by world-renowned hospitals and cancer research leaders, demonstrate CDA diagnostics consistently detects over 20 types of cancer, with 80%-90% sensitivity and specificity rates — usually at the diseases’ earliest stages. And it does so without any harmful patient side effects; generating far fewer “false positives”; at a cost substantially lower than traditional testing (such as imaging); and generating results within minutes of sample submission. Anpac Bio has filed over 200 CDA-related patent applications worldwide – 110 issued in 20 countries and regions (to date). 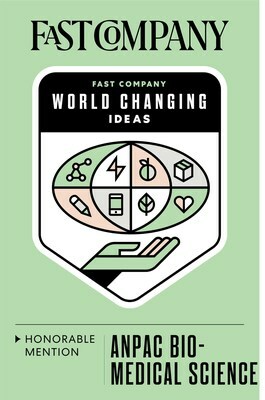 Fast Company Magazine judges selected Anpac Bio-Medical Science Company’s, “Cancer Differentiation Analysis” (CDA) Liquid Biopsy technology as an international, 2019 Health & Wellness “World Changing Ideas Award” (WCI) Honorable Mention recipient. Anpac Bio’s CDA identifies 20+ early-stage cancers with a single blood test. WCI award recipients were selected from over 2,000 nominations worldwide, based on the Ideas’ feasibility; potential for impact; and demonstrated ingenuity and innovation. 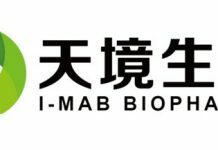 International life sciences leader Anpac Bio-Medical Science Company has developed breakthrough, proprietary, “Cancer Differentiation Analysis” liquid biopsy technology that effectively reinvents cancer screening and early detection. Anpac Bio’s proprietary CDA medical devices analyze simple, standard, non-invasive “Blood Biopsies” – resulting in measurably greater early cancer detection sensitivity and specificity, with no harmful side effects in patients. The proven results of 120,000 cases to date demonstrate CDA’s research validity achieving an average sensitivity and specificity rate range of 75%-90% for 28+ different types of cancer — often identifying the type and location of threatening, diseased cancer cells before they form into tumors. Fully-commercialized and the only company earning liquid biopsy revenue globally, Anpac Bio has filed 250+ CDA-related Patents; 101+ issued to date worldwide. For more information: AnpacBio.com.